As an Android smartphone or tablet user there is surely nothing more annoying or frustrating than trying to download an app from the Play Store unsuccessfully. That next must-have app which everyone is talking and writing about seems like such an achievable goal, but when that error message is generated, the walls of positivity come crumbling down around you. Okay, so it may not be as severe as that, but it can be pretty problematic. Thankfully, there is a potential solution in the form of APK Downloader which allows APK files to be pulled directly from the Play Store’s servers. We all love a good solution to a problem, but let’s clear it up from the offset that APK Downloader is definitely not a tool that makes piracy possible. The functionality and download abilities of this great little Web app is limited to apps that are offered as a free-of-charge download on the store, for obvious reasons. Rather than having to suffer the frustration of not being able to download the app we want or need, APK Downloader takes in the package name for the desired app and makes the rest as easy as clicking a button. The package name of any app can be found in the direct Play Store link for that app immediately after the ?id= section. 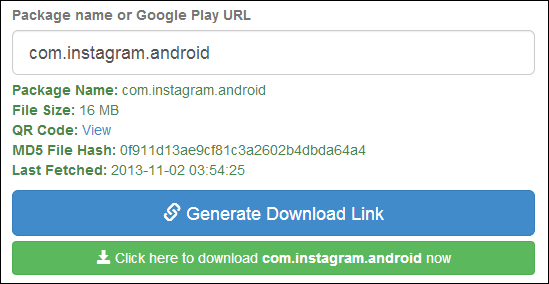 For example, the excellent and free Instagram Android app has a package name of com.instagram.android. It’s this package name that is required by APK Downloader to generate a direct download link for the app’s APK file. When the direct download link has been used and the APK file has been acquired it is then possible to manually side-load the app onto the device and bypass the Play Store errors. Android users will be aware that the side-loading of apps can potentially come with issues. There’s generally a reason why developers may specify certain hardware configurations or dependencies for the app to work correctly. Installing an APK manually to bypass these requirements could potentially cause problems going forward. However, with little knowledge, the APK Downloader tool can prove vital when all else fails. Head on over to the APK Downloader website by pointing your browser to: apps.evozi.com/apk-downloader/ and try the service out for yourself, but remember to take caution when tinkering with the Android system.